I reached out to Frank Schilling to ask him if he would answer the question “Are new gTLDs dead?” for an article on my blog. Frank was kind enough to answer, which I published below. In my email to Frank, I shared my interpretation of the news, which is that premium names weren’t selling well, so by letting them drop, Frank was opening up a revenue stream via the registrar channel. Essentially, instead of one of Frank’s companies paying the other (net zero, not including the small ICANN fees), it would make these names available for anyone to register. This would drive revenue for Uniregistry and may get some of these domain names developed by end user buyers, which in my opinion, is essential for the program to have success. Although I only own a handful of new gTLD domain names, I don’t think the new gTLD program is dead. I don’t really think much has changed besides this model of selling domain names at a premium price. I still most likely won’t be buying the new domain names, but I don’t think it is dead at all. Earlier today, Donuts published a press release announcing it made an unsolicited $70 million cash offer to buy all of the new gTLD domain name extensions owned by Rightside. In the release, the company also shared the letter its CEO Paul Stahura wrote to Rightside CEO Taryn Naidu. Uniregistry is promoting its newly launched .Game domain name extension at this week’s E3 (Electronic Entertainment Expo) conference in Los Angeles, which kicks off today. Circling the event venue will be ten billboard trucks with .Game advertising on them to help draw awareness to the new .Game domain name extension. When Uniregistry launched its Uniregistry Market, one of the biggest changes was its landing page designs. The new landing pages were devoid of graphic headers that showed images related to the PPC links, and there were some other major changes to the font and layout. One of the first things I noticed was that the bright green offer bar at the top of landing pages was changed to blue. 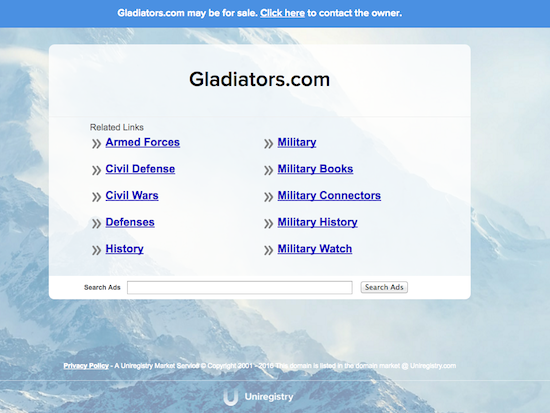 This seemed to be a bit counterproductive since the blue seems to blend into the rest of the landing page, and mentioning that the domain name may be available for sale is important for people who make a living selling domain names. A little over a week ago, Uniregistry debuted new landing pages, which ushered in the era of Uniregistry Market. The graphic header was removed, and the landing pages all feature blue hyperlinks and a background photograph of a snowcapped mountain. For those of us who rely on domain name sales as a primary source of revenue, the biggest change was the top of the landing page. The bright green offer bar, which had previously been bright orange, was replaced by a blue offer bar with white text. At the time, I wondered how much of an impact this change would have on the number of offers I received. Because I have a fairly small domain portfolio and don’t park all of my domain names with Uniregistry, the change in the number of offers I receive would not be statistically significant. An extra two or three offers could throw off those numbers. Instead, I asked Frank Schilling if he could share the increase or decrease in offers received in the week since the change was made. The bright green “for sale” bar at the top of the landing pages is now blue, and the font on the landing page is also in blue. Clicking through on the “for sale” link brings you to the DNS offer page, which does not appear to have changed (at least not yet).